Okko is an international interior company based in Stockholm, Sweden. We specialize in acoustic solutions that fuse form and function. 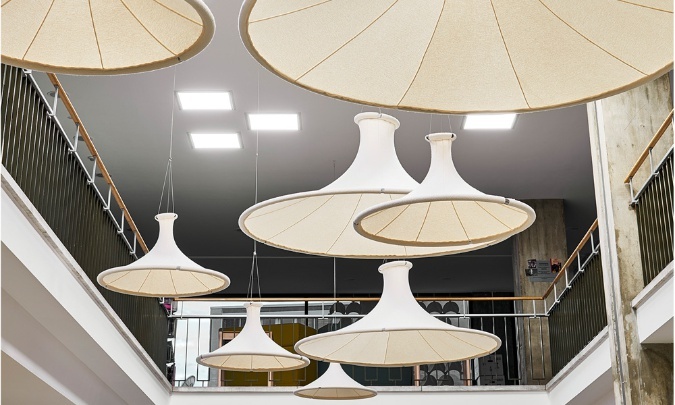 Our assignments vary from interiors of private homes to creating innovative acoustic solutions in public places such as museums, auditoriums, restaurants, libraries etc. We always work with the highest quality of sound absorbers, always with successful and positive results. For some examples you will find work by Okko in the large exhibition hall at the Architect and Design Centre in Stockholm, at the impressive hall of The National Property Board of Sweden, at the childrens library Sello in Helsinki, at the Sekundarschule Holbein in Basel, in a conference room at the Linked In office in Stockholm and many more. No project is too big or small, for Okko there is a solution for all kinds of interiors. In the development of acoustic materials Okko strives to be a leader. Exploring and finding new ways and possibilities constitutes an integral part of Okko’s philosophy of design.